Naval Surface Warfare Center Panama City Division (NSWC PCD) engineers are developing tools to enable U.S. Marine Expeditionary Forces (MEFs) to more accurately predict energy consumption needs in theater. NSWC PCD Expeditionary Systems Division (Code E30) engineers were asked by Marine Corps Systems Command (MARCORSYCOM) to reduce the energy consumption of Marine Corps Combat Operations Centers (COCs). MARCORSYCOM acquires and provides life-cycle support of ground weapon and information technology (IT) systems for U.S. Marines. Together, leaders from MARCORSYCOM and NSWC PCD analyzed the COCs they noted that almost 70 percent of all the energy was being used to heat and cool the shelters. Additionally, all of the predictions were based upon vendor specifications or calculations. The engineers thought there was a better way. A new computerized model allows users to incorporate shades, radiant barriers, and tent colors into the heat transfer calculations to determine the need for heating and air conditioning, Since the model utilizes a weather input file, it can predict tent temperatures anywhere in the world, thus allowing field units to predict supply needs before deployment. The new algorithm and model have been shared with the U.S. Marine Corps and the U.S. Army for consideration of use. The Energy Team is presently completing an Analysis of Alternative for Hybrid Power Systems that will result in new power systems for the U.S. Marines. 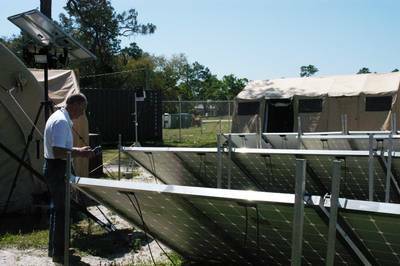 One of the hybrid solutions is a U.S. Army micro-grid that utilizes six, 60 kw generators that are switched on or off as needed. NSWC PCD is expected to receive one U.S. Army micro grid for project testing in the summer of 2013.